Jam v. International Finance Corp: May international organizations violate rights with impunity? 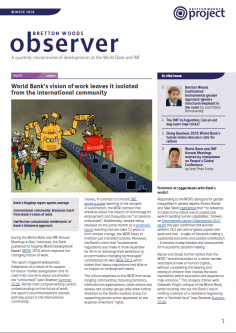 Supreme Court preview: is the World Bank Group above the law? On 31 October, the Supreme Court of the United States heard oral arguments on the Jam versus IFC case, brought by a local fishing community harmed by the Tata Mundra power plant in Gujarat, India, which was partially financed by the International Finance Corporation (IFC, the World Bank’s private sector arm). As US-based NGO EarthRights International, which represents the affected communities, noted, the suit against the IFC was brought after the community was unable to receive remedy from the IFC or its client (see Observer Summer 2018). The US Supreme Court is deciding on the question of IFC’s ‘absolute immunity’, which the organisation claims to be based on the 1945 International Organisations Immunity Act (IOIA) that granted international organisations the same immunity from lawsuit as is enjoyed by foreign governments. The plaintiffs, on the other hand, argue that foreign governments’ immunity is now guided by the 1976 Foreign Sovereign Immunities Act, under which certain categories of lawsuits, such as those related to commercial profit-making activities, are exempted from immunity (see Observer Summer 2018). The key question in the case is whether international organisations’ immunity refers to the time of the lawsuit, or the moment when the IOIA was enacted. At the hearings, Jeffrey Fisher of Stanford Law School, which represented the plaintiffs, argued that, “The word ‘is’ in this court’s jurisprudence always, always means at the time of suit, not at the time the statute was passed.” In contrast, the IFC argued that the IOIA “prescribes a standard of virtual absolute immunity that is fixed and not evolving.” The representative of the US federal government, Jonathan Ellis, noted that the plaintiffs have the “far better reading” of the statutory phrase. However, he expressed doubts about the case’s ability to meet the commercial activities exception of the 1976 act. The US Supreme Court is expected to take a decision by summer 2019.